Everyone wants or even needs to save every penny they can. So, it’s no surprise, that many self-confident DIYer’s will have a go at doing some kind of electrical work either for themselves or for friends. That’s fine if it’s replacing a blown fuse in a plug or finding which one of those pesky lamps in the Christmas tree has actually blown. The thing is, in many cases, it doesn’t stop there, and as success breed’s confidence, larger and more complex jobs are attacked with gusto. The odd additional 13-amp socket, wall lights in the lounge, a sub-main to the new, very expensive conservatory. 1. The breaker goes out and stays out. Each year, on average, around 10 people die and 750 are injured in accidents involving unsafe electrical installations in the home. In addition to this, around 2000-2500 house fires are typically caused by faulty electrical installations in any given year. The shame of it is, is that you never really saved that much anyway so you could have engaged a suitably qualified Electrician to do the work in the first place. That’s all well and good, but how does one find that elusive suitably qualified Electrician? There are a few tips you can follow so that you are more likely to get a reliable, qualified and good value electrician. Look for Customer Reviews or ask for referrals. Customer reviews are one of the best ways to spot a rogue trader from a reliable tradesman. You should ensure that they are members of the NICEIC (National Inspection Council for Electrical Installation Contracting) or ECA (Electrical Contractors’ Association). By choosing an accredited company, it ensures that the work of the electricians you engage meet all legislative standards. Inspectors audit these companies on an annual basis. The main benefits of using a registered contractor that is that it provides you with the peace of mind that the electricians are conscientious about safety and competence, their work will comply with building regulations and their work is backed by Insurance Warranty to protect consumers from non-compliant work. Your contractor should also have what is called Part P (Of the building regulations) because this affects all electrical work carried out in dwellings. 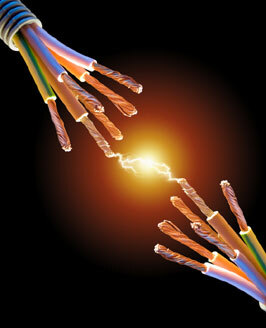 The rules of Part P have been designed to ensure that electrical work is safe. A high standard of service quality is expected from contractors which means complaints regarding poor quality workmanship should be resolved to a satisfactory outcome. An equally important quality in your electrical contractor is the ability to communicate well. They should be friendly, courteous and prompt when replying to any questions and queries you may have. They should be totally transparent with prices giving you an idea of costs before they begin, along with an estimate of how long the works will take. At Stuart Manuel Electrical Contractors you are our priority. We offer very competitive rates and a very high level of service, which, we believe, is second to none. But you don’t have to take our word for it, we are happy to provide you with references to put your mind at rest. Give us a call now and get started.